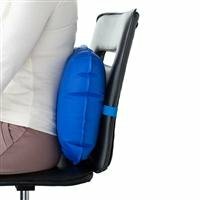 The patented design of this back pillow provides a custom fit to everyone's lordotic curve. Three interconnecting air chambers mold around and cradle the back giving firm yet tender pressure to relax back muscles. Comes with an adjustable elastic strap to provide secure positioning and is guaranteed for one full year. Product measures 18" x 15"
If you have any questions about this product by Medic-Air, contact us by completing and submitting the form below. If you are looking for a specif part number, please include it with your message.